Boston has two main train stations: South Station, and North Station. Both are terminals, about 2 km apart, each serving its own set of suburbs; as a result, over the last few decades there have been calls to unify the system with a regional rail tunnel connecting the two systems. This tunnel, called the North-South Rail Link, or NSRL, would have been part of the Big Dig if its costs hadn’t run over; as it were, the Big Dig reserved space deep underground for two large bores, in which there is clean dirt with no archeological or geotechnical surprises. The NSRL project had languished due to Massachusetts’ unwillingness to spend the money on it, always understood to be in the billions, but in the last few years the pressure to build it intensified, and the state agreed to fund a small feasibility study. A presentation of the draft study came out two days ago, and is hogwash. It claims on flimsy pretext that NSRL would cost $17 billion for the tunnel alone. It also makes assumptions on service patterns (such as manual door opening) that are decades out of date not just in Europe and East Asia but also in New York. The Fiscal and Management Control Board, or FMCB, discusses it here; there’s a livestream as well as a link to a presentation of the draft study. The content of the study is so weak that it has to have been deliberate. The governor does not want it built because of its complexity, no matter how high its benefits. Thus, the state produced a report that sandbags a project it doesn’t want to build. People should be fired over this, starting with planners at the state’s Office of Transportation Planning, which was responsible for the study. The way forward remains full regional rail modernization. As for the cost estimate, an independent study by researchers at Harvard’s Kennedy School of Government estimates it at about $5 billion in today’s money; the new study provides no evidence it would be higher. I urge good transit activists in Massachusetts, Rhode Island, and New Hampshire to demand better of their civil servants. Unlike the other tunnels on the list, Crossrail has stations frustrating any simple per km cost analysis. The headline cost of Crossrail is £15 billion; however, I received data from a freedom of information request showing that the central (i.e. underground) portion is only £11.6 billion and the rest is surface improvements, and of this cost the big items are £2.2 billion for tunneling, £4.1 billion for stations, £1 billion for tracks and systems, and £2.7 billion for overheads and land acquisition. The tunneling itself is thus around $150 million per km, exclusive of overheads and land (which add 30% to the rest of the project). All of this is consistent with what I’ve found in New York: tunneling is for the most part cheap. With the exception of Crossrail, the above projects consist of two large-diameter bores. The mainline rail tunnels (California HSR and Pannerdensch Kanaal) are sized to provide plenty of free air around the train in order to improve aerodynamics, a feature that is desirable at high speed but is a luxury in a constrained, low-speed urban rail tunnel. The highway tunnels have two large-diameter bores in order to permit many lanes in each direction. The plan for NSRL has always been two 12-meter bores, allowing four tracks; at the per-km boring cost of the above projects, this 5 kilometer project should cost perhaps a billion dollars for tunneling alone. The stations are typically the hard part. However, NSRL has always been intended to use large-diameter tunnels, which can incorporate the platforms within the bore, reducing their cost. Frequent commenter Ant6n describes how Barcelona used such a tunnel to build Metro Lines 9 and 10, going underneath the older lines; the cost of the entire project is around $170 million per km, including a cost overrun by a factor of more than 3. Vertical access is likely to be more difficult in Boston under the Big Dig than in Barcelona, but slant shafts for escalators are still possible. At the worst case scenario, Crossrail’s station costs are of an order of magnitude of many hundreds of millions of dollars each, and two especially complex ones on Crossrail 2 are £1.4 billion each; this cost may be reasonable for Central Station at Aquarium, but not at South Station or North Station, where there is room for vertical and slant shafts. It’s possible that the study made a factor-of-two error, assuming that since the mainline rail comparison projects have two tracks, their infrastructure is sized for two urban rail tracks, where in reality a small increase in tunnel diameter would permit four. Researchers at the Harvard Kennedy School of Government came up with an estimate of $5.9 billion in 2025 dollars for a four-track, three-station NSRL option, which is about $5 billion today. Their methodology involves looking at comparable tunneling projects around the world, and averaging several averages, one coming from American cost methodology plus 50% contingency, and two coming from looking at real-world cost ranges (one American, one incorporating American as well as rest-of-world tunnels). Their list of comparable projects includes some high-cost ones such as Second Avenue Subway, but also cheaper ones like Citybanan, which goes deep underneath Central Stockholm with mined tunnels under T-Centralen and Odenplan, at $350 million per km in today’s money. Note: The Harvard Study did not include cost for the tunnel boring machine launch pit and only accounted for 2.7 miles of tunneling (the MassDOT studies both accounted for 5 miles of tunneling), and no contingency for risk. This claim is fraudulent. The Kennedy School study looks at real-world costs (thus, including contingency and launch pit costs) as well as at itemized costs plus 50% contingency. Moreover, the length of the NSRL tunnel, just under 5 km, is the same either way; the MassDOT study seems to be doubling the cost because the project has four tracks, an assumption that is already taken into account in the Kennedy School study. This, again, is consistent with a factor-of-two error. Moreover, the brazenness of the claim that a study that explicitly includes contingency does not do so suggests that MassDOT deliberately sabotaged NSRL, making it look more expensive than it is, since the top political brass does not want it. Governor Baker said NSRL looks expensive, and Secretary of Transportation Stephanie Pollack is hostile as well; most likely, facing implicit pressure from above, MassDOT’s overburdened Office of Transportation Planning scrubbed the bottom of the barrel to find evidence of absurdly high costs. Massachusetts really does not want or understand electrification. Even some NSRL supporters believe electrification to be an expensive frill that would sink the entire project and think that dual-mode locomotives are an acceptable way to run trains in a developed country in the 2010s. In fact, dual-mode locomotives’ weak performance serves to raise tunneling costs. Struggling to accelerate at 0.3 m/s^2 (or 0.03 g), they cannot climb steep grades: both the Kennedy School and MassDOT studies assume maximum 3% grades, whereas electric multiple units, with initial acceleration of 1.2 m/s^2, can easily climb 4% and even steeper grades (in theory even 10%, in practice the highest I know of is 7%, and even 5% is rare), permitting shorter and less constrained tunnels. As a result of its allergy to electrification, MassDOT is only proposing wiring between North Station and the next station on each of the four North Side lines, a total of 22.5 route-km. This choice of which inner segments to electrify excludes the Fairmount Line, an 8-stop 15 km mostly self-contained line through low-income, asthma-riven city neighborhoods (source, PDF-pp. 182 and 230). Even the electrification the study does agree to, consisting of about 30 km of the above surface lines plus the tunnels themselves, is projected to cost $600 million. Nowhere in the world is electrification so expensive; the only projects I know of that are even half as expensive are a pair of disasters, one coming from a botched automation attempt on the Great Western Main Line and one coming from poor industry practices on Caltrain. A more reasonable American budget, based on Amtrak electrification costs from the 1990s, would be somewhat less than $2 billion for the entire MBTA excluding the already-wired Providence Line; this is the most familiar electrification scheme to the Bostonian reader or planner. At French or Israeli costs, the entire MBTA commuter rail system could be wired for less than a billion dollars. Another necessary element is conversion to an all-EMU fleet, to increase performance and reduce operating costs. Railway Gazette reports that a Dutch benchmarking study found that the lifecycle costs of EMUs are half as high as those of diesel multiple units. As the MBTA needs to replace its fleet soon anyway, the incremental cost of electrification of rolling stock is negative, and yet the study tacks in $2.4 billion on top of the $17 billion for tunneling for vehicles. In addition to the sandbagged costs, the study indicates that the people involved in the process do not understand modern railroad operations in several other ways. First, door opening. While practically everywhere else in the first world doors are automatic and opened with the push of a button, the MBTA insists on manual door opening. The MassDOT study gives no thought to high platforms and automatic doors (indeed, the Old Colony Lines are already entirely high-platform, but some of their rolling stock still employs manual door opening), and assumes manual door opening will persist even through the NSRL tunnels. Each train would need a squad of conductors to unload in Downtown Boston, and the labor costs would frustrate any attempt to run frequently (the study itself suggests hourly off-peak frequency; in Paris, RER lines run every 10-20 minutes off-peak). Second, capacity. The study says a two-track NSRL would permit 17 trains per hour in each direction at the peak, and a four-track NSRL would permit 21. The MBTA commuter rail network is highly branched, but not more so than the Munich S-Bahn (which runs 30 at the peak on two tracks) and less so than the Zurich S-Bahn (which before the Durchmesserlinie opened ran either 20 or 24 tph through the two-track tunnel, I’m not sure which). Worse, the FMCB itself is dumbfounded by the proposed peak frequency – in the wrong direction. While FMCB chair Joe Aiello tried explaining how modern regional rail in Tokyo works, other members didn’t get it; one member dared ask whether 17 tph is even possible on positive train control-equipped tracks. My expectations of Americans are low enough that I am not surprised they are unaware that many lines here and in Japan have automatic train protection systems (ETCS here, various flavors of ATC in Japan) that meet American PTC standards and have shorter minimum headways than every 3-4 minutes. But the North River Tunnels run 24-25 peak tph into Manhattan, using ASCES signaling, the PTC system Amtrak uses on the Northeast Corridor; the capacity problems at Penn Station are well-known to even casual observers of American infrastructure politics. A state in which the FMCB members didn’t really get what their chair was saying about modern operations is going to propose poor operating practices going forward. MassDOT’s study assumes low frequency, and, because there is no line-wide electrification except on the Providence Line and eventually South Coast Rail (where electrification is required for wetland remediation), very low performance. MassDOT’s conception of NSRL has no infill stops, and thus no service to the bulk of the contiguous built-up area of Boston. Without electrification or high platforms, it cannot achieve high enough speeds to beat cars except in rush hour traffic. Limiting the stop penalty is paramount on urban rail, and level boarding, wide doors, and EMU acceleration combine to a stop penalty of about 55 seconds at 100 km/h and 75 seconds at 160 km/h; in contrast, the MBTA’s lumbering diesel locomotives, tugging coaches with narrow car-end doors with several steps, have a stop penalty of about 2.5 minutes at 100 km/h. The presentation makes it very clear what the value of MassDOT’s NSRL study is: at best none, at worst negative value through muddying the conversation with fraudulent numbers. The Office of Transportation Planning is swamped and could not produce a good study. The actual control was political: Governor Baker and Secretary of Transportation Pollack do not want NSRL, and both the private consultant that produced the study and the staff that oversaw it did what the politicians expected of them. Heads have to roll if Massachusetts is to plan good public transportation. The most important person good transit activists should fight to remove is the governor; however, he is going to be easily reelected, and replacing the secretary of transportation with someone who does not lie to the public about costs is an uphill fight as well. Replacing incompetent civil servants elsewhere is desirable, but the fish rots from the head. Activists in Rhode Island may have an easier time, as the state is less hostile to rail, despite the flop of Wickford Junction; they may wish to demand the state take lead on improving service levels on the Providence Line, with an eye toward forcing future NSRL plans to incorporate good regional rail practices. In New Hampshire, provided the state government became less hostile to public investment, activists could likewise demand high-quality commuter rail service, with an eye toward later connecting a North Station-Nashua-Manchester line to the South Side lines. But no matter what, good transit activists cannot take the study seriously as a planning study. It is a political document, designed to sandbag a rail project that has high costs and even higher benefits that the governor does not wish to manage. Its cost estimates are not only outlandish but brazenly so, and its insistence that the Kennedy School study does not include contingency is so obviously incorrect that it must be considered fraud rather than a mistake. Nothing it says has any merit, not should it be taken seriously. It does not represent the world of transportation planning, but rather the fantasies of a political system that does not understand public transportation. Which Older Lines Should Express Rail Have Transfers to? In my writings about metro network design I’ve emphasized the importance of making sure every pair of intersecting lines have a transfer. Moreover, I’ve argued that missed connections often come from having very wide stop spacing, because large metro networks have very closely-spaced lines in the core, and if the stop spacing in the core is too wide, as in Moscow, then lines will frequently cross without transfers. In contrast, in Paris, where the Metro has very closely-spaced stops, there is only one missed connection on the Metro, between Lines 5 and 14. However, what’s missing from this discussion is what to do on lines that, due to network design, have to run express and miss some connections. This question mattered to most RER lines and currently matters to Crossrail and Crossrail 2, and will be critical in any New York regional rail plan. Lines that are orthogonal to the newly-built express lines. Crossrail is the dashed gray line. Between Paddington and Liverpool Street, it intersects seven north-south lines, including five in rapid succession on the West End; stopping at all of Bond Street, Oxford Circus, Tottenham Court Road, and Holborn would slow down too much what’s intended to be an express relief line to the Central line. Observe that in contrast with the RER A’s convoluted transfer at Auber, the RER B simply expresses between Chatelet-Les Halles and Gare du Nord, missing the connection to the east-west Lines 3, 8, and 9 and the north-south Line 7, and only connecting to the circumferential Line 2 via a long underground passageway. The reason for this is that a transfer station at Bonne Nouvelle or Sentier would be very expensive to construct; the RER’s stations were all extremely costly, and the RER A’s record of $750 million per km for the Nation-Auber segment remains unbroken outside the Anglosphere. On Crossrail (the recordholder in cost per km outside the US, soon to be overtaken by Crossrail 2), it’s the stations that drive up costs as well, and the same problem is even more acute in New York. The tension is then between the network effects of including more transfer points, and the costs and slowdowns induced by stopping more often. The first point in my claim at the beginning of this post follows immediately: it’s more valuable to stop at transfer points to busier lines. The RER A misses Line 5 entirely, as does the express Line 14, because Line 5 is so weak that it’s not worth it to detour from Gare de Lyon through Bastille to connect to it; the oldest plans for the RER A had a stop at Bastille and not at Gare de Lyon, but under SNCF’s influence the system was redesigned to connect to the train stations better and thus Bastille was replaced. Whereas the RER A in theory connects to every north-south one except the weakest (although the second strongest after Line 4, Line 13, has an even longer connection than at Chatelet), Crossrail does the opposite. The busiest station in London excluding mainline stations is Oxford Circus, thanks to the three-way transfer of the Bakerloo, Victoria, and Central lines; the Victoria line is the busiest in the system per km (although the longer Northern and Central lines have more riders), and it’s certainly the busiest north-south trunk line. However, plans to have a transfer to both Bond Street and Oxford Circus were rejected in favor of a connection to Bond Street alone. 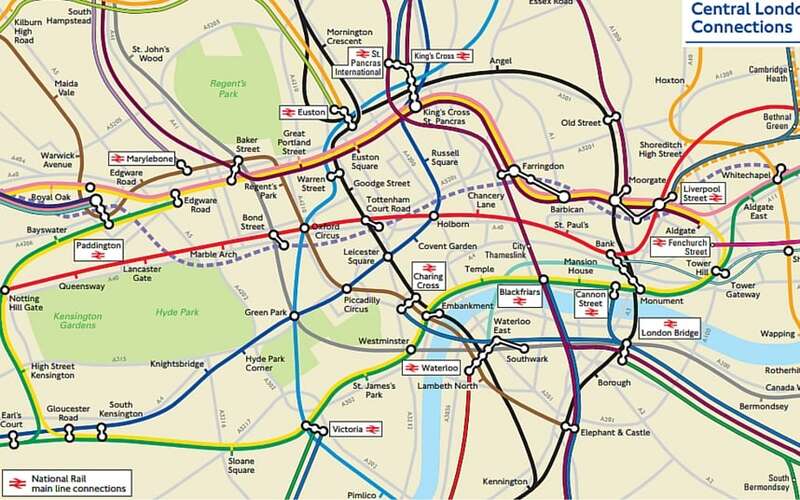 The reason is that London’s low-capacity passageways get congested, and TfL’s hamfisted solution is to omit critical transfers, a decision also made at the Battersea extension of the Northern line, which will miss a connection to the Victoria line at Vauxhall. This brings me to the second transfer priority: it’s the most important to connect to orthogonal lines. The reason is that parallel lines, especially closely parallel lines, are less likely to generate transfers. New York’s four-track subway lines have very high volumes of local-express transfers, because those are easy cross-platform interchanges; as soon as any walking between platforms is required (for example, on the Lexington Avenue Line at 59th and 86th Streets), transfer volumes fall dramatically. In Paris, transfers between Line 1 and the RER A happen, but usually for longer-distance travel; I find it faster to take Line 1 from Nation to Chatelet than to take the RER A, even without any transfer, purely because it’s easier to get between the street and the Metro platforms at both ends. This issue was never really in contention when Paris built the original RER system. The one place where the RER prioritized a transfer to a same-direction Metro line over an orthogonal one, Gare du Nord, is such an important destination for commuter and intercity trains that it’s obviously justified to prioritize it over an easier connection to Line 2. However, more recently, the RER E has seen this issue surface with the location of the infill Rosa Parks station. The RER E could have sited a station at the intersection with Line 5, but Line 5 goes northeast and serves much the same area as the RER E, so the network effects from an interchange would be weak. Instead, the station is sited to interchange with the circumferential T3 tramway, which opens up a connection toward Nation and eventually toward Porte d’Asnieres. In London, the same question is critical to the central route of Crossrail 2. The current plan has three Central London stops: Victoria, Tottenham Court Road (with a transfer to Crossrail), and Euston-St. Pancras. But Victoria itself is not much of a destination, and of the two lines served, the District and the Victoria, the Victoria line is parallel to Crossrail 2 rather than orthogonal to it. The purpose of Crossrail 2 is to add north-south capacity through the West End to decongest the Victoria line and reduce the shuffle at Victoria station between mainline trains and the Underground; to this end, there’s no need to stop at Victoria station itself. To this effect, Martha Dosztal proposes moving Crossrail 2 to Westminster or possibly Charing Cross. Instead of spending $2 billion on a station at Victoria, London would need to spend probably a comparable amount on a station that interchanges with lines that go northwest-southeast like Jubilee or Bakerloo rather than on the parallel Victoria line; moreover, Westminster and Charing Cross both have connections to the District line, so Crossrail 2 would still connect to all three east-west Underground lines. Finally, the application to New York is the most delicate. New York’s scores of missed connections come from deliberate indifference on the IND’s part to transfers with the older lines rather than any systematic attempt at prioritizing important interchanges; the older IRT and BMT systems have between them just two missed connections (3/L in Brooklyn, 4-5/R-W in Lower Manhattan). But including better connections in the event the city builds more rail lines remains critical. Second Avenue Subway gets this right by having a cross-platform transfer to the east-west F; there’s no transfer to the north-south Lexington Line, but this is less important given Second Avenue’s role as a Lexington relief line. Regional rail transfers are especially circumscribed in New York given the system’s nature as a few short tunnels: new tunnels across the Hudson, and ideally a connection between Penn Station and Grand Central. This is why there is little room for improving connectivity between the subway and what I call Lines 1-3 of New York regional rail. However, the priorities I’m advocating in this post suggest two important things about Penn Station: first, it’s important to reopen passageways to Sixth Avenue to allow connections to the NQRW and BDFM trains; and second, it’s not important to have a connection to the 7 at Hudson Yards, as IRUM proposes. On more speculative lines involving longer tunnels, the same priorities point to my proposed stopping pattern in and around Lower Manhattan. What I call Line 4, a north-south line from Grand Central to Staten Island stopping at Union Square and Fulton Street would intersect the east-west subways: the 7 at Grand Central, the L at Union Square, and PATH and most Brooklyn-bound trains at Fulton Street. The only missed subways – the F/M at Houston Street and the N/Q at Canal – go mostly north-south (except the M, which has a same-platform transfer with the J/Z, connecting at Fulton). Likewise, what I call Line 5, connecting from Pavonia to Atlantic Terminal, would connect to most north-south subways at Fulton Street. Ideally, it’s better to make every interchange, and subway builders around the world should aim for very long-term planning in order to prevent missed connections in the future. However, when the inevitable changes happen and missed connections are unavoidable, there are emergent rules for which are more important: busier lines are more important than less busy lines, and less obviously, lines that are orthogonal to the new line are more important than ones that are parallel. These priorities make it possible to build express lines that maximize regional connectivity with minimal loss of travel time due to making local stops. 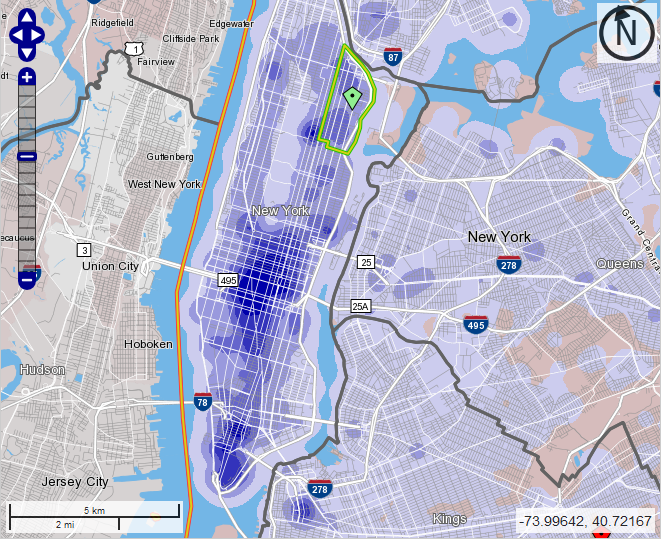 Most of my thinking about public transit comes from large, dense cities, especially New York. In those cities, transit ridership is not a problem; only cost is. When such cities have decent cost control, they can build massive expansion programs, as Paris is. But most of the developed world is not New York, Paris, London, Tokyo, or other transit cities. A large and (thanks to differential national population growth rates) growing share of the developed world lives in fast-growing, low-density city regions with no public transit to speak of, such as the American Sunbelt and its counterparts in Canada and Australia. I’ve had to intellectually grapple with public transit in two American Sunbelt cities in which current transit usage is a rounding error and the built form is wholly auto-oriented: Orlando (which I was asked about by a Twitter mutual) and Nashville (which just voted against a flawed light rail plan by an overwhelming margin). In those areas, there is no chance for any public transit, provided the urban form stays as it is – but fortunately such cities can leverage their high growth rates to change their urban form, as Calgary did in the 1980s and 90s. The density and growth demand axes are not meant to come from a single quantitative metric; density is a subjective mix of residential and job density, whereas growth demand refers to either population growth or the demand for more housing as expressed by price signal. In San Francisco, most likely the richest metro area in the world, density is middling, and growth demand is higher than even in New York and London; in the American Rust Belt, density is fairly low and there is also little demand for more; in some cities on the margin of the first world there is little demand for more growth but high preexisting density. It goes without saying that it’s easier to build new rapid transit lines on the upper right corner than on the lower left one. The situation of the American Sunbelt, most of which goes in the bubble of Texas and Georgia, is difficult. Residential density is extremely low, so the ridership base near potential rail lines is low. Moreover, streets are usually designed exclusively around auto use, so passengers are unlikely to walk a kilometer to the train station the way they routinely do in transit cities. At the destination end, things aren’t much better – American cities have high-rise CBDs, but few jobs locate there or in surrounding dense neighborhoods. The Orlando CBD has about 80,000 jobs, in a metro area of 2.5 million people. Disney World adds another 37,000, but is not surrounded by any serviceable residential neighborhoods, and has to be at the end of any reasonable transit service coming from the CBD. Nashville, a metro area of nearly 2 million, has a CBD with 36,000 jobs. The medical center to the southwest adds another 33,000, and this time it could plausibly lie on a rail trunk, but most of the useful urban arterials converge on the CBD and not on the medical center. In contrast, Washington, with 5.5 million people, has 280,000 people working at the CBD (from the Green and Yellow Lines to just beyond Dupont Circle and Foggy Bottom), 77,000 in the Rosslyn-Ballston corridor, and 33,000 in Crystal City and at National Airport and the Pentagon. Both the percentages and the absolute numbers (including job density) count: there is a great mass of people who would be interested in taking rail to Washington CBD jobs but not to Orlando or Nashville CBD jobs. High-growth areas are likely to have been small a few decades ago. For the most part the metro areas in question were too small in the heyday of rail transportation to have inherited a large legacy rail network. Even the ones that did, including Atlanta and Perth, have less legacy rail than older cities of comparable size – compare Atlanta with Philadelphia, or Perth with Brisbane. And most North American boomtowns are not Atlanta. Miami has two north-south mainlines and a handful of east-west connections, none at the right place for commuter rail. Orlando has a north-south trunk with a branch to the north, and Nashville a few branches, but they’re surrounded by industrial land use and not by the sort of suburbs that developed around commuter rail in the Northeast. A commuter rail-based network can still work, but only with extensive greenfield lines. Disney World is not on any legacy rail line, because it developed long after rail stopped being a relevant mode of transportation outside large urban areas. But even then, gaps in coverage are unavoidable, as the dense neighborhoods of such cities did not develop around legacy rail. The big question about TOD is, who is it for? In Nashville specifically, the far left opposed the light rail plan, essentially because it would cannibalize funding that could go to public housing. Now, public housing could be used to beef up density along rail corridors. Stockholm built public housing simultaneously with the subway, placing housing projects on top of rail branches, and as a result has per capita ridership today that’s not much lower than the level of Paris, Berlin, or Munich. The problem is that public housing is horrendously expensive. A house in low-cost American cities costs around $150,000, but apartments cost more, so $200,000 per household is more likely even with some economies about size. Most of this cost is impossible to recover through rent – if low-income households made enough money to pay market rent in nice apartments, they’d just rent these apartments on the open market. The American Sunbelt does not lack for developable suburban land. Market-rate housing is much easier to construct – for one, developers make a profit on it, and so are eager to put up their own money. The problem is that in cities like Nashville and Orlando, the middle class has close to 100% car ownership, and a large majority of households have one car per adult. The real estate industry is not going to spontaneously build housing with less parking or pedestrian-oriented retail. In San Diego, developers build more parking than the minimum at University Avenue and 30th Street, according to Duncan McFetridge of the Cleveland National Forest Foundation. University is a bus corridor and not a light rail corridor, but the bus frequency there isn’t terrible, and the area is pretty walkable for a low-density city. In Los Angeles, I’ve read analysis that blames the region’s falling transit ridership on gentrification, explaining that in gentrifying inner neighborhoods like Boyle Heights, the middle class drives whereas the working class takes transit. It’s not like here or in New York, where recent gentrifiers rarely own cars. How did Calgary make it work? Calgary is a metro area of somewhat more than a million people. Its economy is based on oil, and when oil prices were higher earlier this decade its average income was comparable to that of San Francisco; its politics is thoroughly conservative, which means there is no progressive impetus for walkability or green transit. Nonetheless, it built light rail lines that get about 100 million annual riders today. Its transit mode share is 16%, higher than that of any American metro area except New York (or, in the most restrictive definition, San Francisco). This is with no residential TOD to speak of: the vast majority of housing in Calgary is single-family and low-density, and from what I’ve seen there’s almost no dense residential development near the stations. The big thing Calgary did was develop its CBD to be high-rise. In the early 1980s Calgary was a small, monocentric city, and since then it’s grown more monocentric, developing downtown parking lots as high-rise buildings. When I visited it had a more prominent high-rise downtown than Providence, a bigger and older metro area, and walking between the high-rises was reasonably pleasant. In low-density cities with demand for more growth, the best opportunity appears to be centralizing jobs in the CBD. The straightforward application involves developing parking lots, as in Calgary, and relying on the private market to do the rest of the job. In both Nashville and Orlando, there are also more proactive approaches, specific to their urban layouts. In Nashville, the high job density at the medical center calls for developing a continuous corridor from the CBD, about 3 km long. This corridor could plausibly get an east-west subway, in contrast with the north-south subway in the rejected light rail plan. In Orlando, the Disney World cluster calls for some residential upzoning and sprawl repair around that area, which would strengthen the case for building a rail line between that area and the CBD. Growing cities can use their growth to support more auto-oriented development (as the big American cities did in the postwar era) or to support more public transit. This is understood in cities that already have a transit-oriented core, but it’s equally true in cities that don’t really have any public transit, like the entire American Sunbelt. Calgary, starting with very low population, managed to build a decent if not great public transit network centered on its light rail system, and the same should be doable in American cities of comparable size and age. Do Rich and Poor People Work in Different Neighborhoods? There are three income classes available, and I looked at the bottom and top ones, but the middle one, still skewed toward the working class, looks the same as the bottom class. The biggest observation is that Midtown is dominant regardless of income, but is more dominant for middle-class workers (more than $40,000 a year) than for low-income ones (up to $15,000, or for that matter $15,000-40,000). The colors are relative, and the deepest shade of blue represents much more density for middle-class workers, even taking into account the fact that they outnumber under-$15,000 workers almost four to one. Among the lowest-income workers we see more work on Queens Boulevard and in Williamsburg, Flushing, and the Hub, but these remain tertiary workplaces at most. 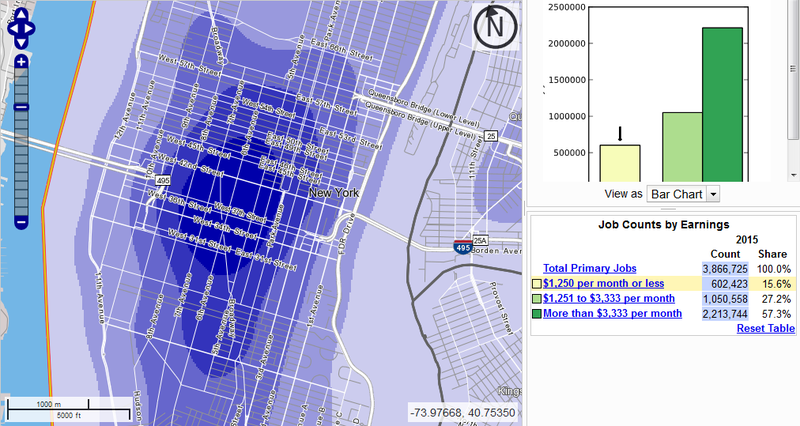 The only place outside Midtown, Lower Manhattan, or Downtown Brooklyn (which includes all city workers in Brooklyn due to how the tool works, so it looks denser than it is) that has even the third out of five colors for low-income workers is Columbia, where the low-income job density is one-third that of Midtown, and where there is also a concentration of middle-class workers. I chose these two neighborhoods to compare because they exhibit very large differences in average income and are on the same subway line. Potentially there could be a difference between where East Siders and West Siders work due to the difficulty of crosstown commuting, so I thought it would be best to compare different socioeconomic classes of people on the same line. With the East Side-only restriction, we see two Uptown job centers eclipse Columbia: Weill-Cornell Medical Center in Lenox Hill at the southeast corner of the Upper East Side, and Mount Sinai Hospital at the northwest corner. 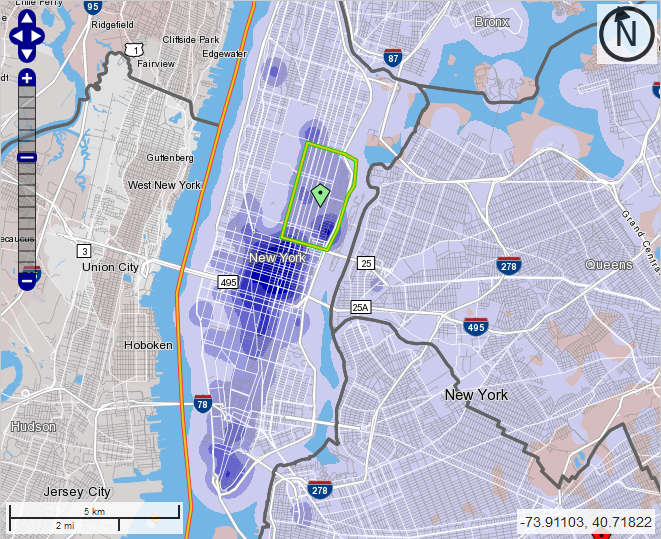 For the middle class, Midtown ranges from 34th to 57th Street and peaks around 47th. For the lowest-income workers, it ranges from 28th to 49th and peaks in the high 30s. My best explanation for this is that Midtown South and Union Square are more retail hubs than office hubs, featuring department stores and shopping centers, where the rich spend money rather than earning it. In a deindustrialized country like the US or France, the working class no longer works in manufacturing or logistics. There are a lot of truck drivers today – 3.5 million in the US – but in 1920 the American railroad industry peaked at 2.1 million employees (source, PDF-p. 15), nine times today’s total, in a country with one third the population it has today and much less mobility. Manufacturing has plummeted as a share of employment, and is decreasing even in industrial exporters like Germany and Sweden. Instead, most poor people work at places that also employ many high-skill, high-income workers, such as hospitals and universities, or at places where they serve high-income consumption, such as retail and airports. Since the working class works right next to the middle class, the nature of bosses’ demands of workers has also changed. Low-skill works now involves far more emotional labor; in Singapore, which makes the modern-day boss-worker relationships more explicit than the Anglosphere proper, there are signs all over the airport reminding workers to smile more. Nobody cares if auto workers smile, but they’re no longer a large fraction of the working class. With the working class employed right next to the middle class, there is also less difference in commuting. For the most part, the same transportation services that serve middle-class jobs also serve working-class jobs and vice versa. This remains true even across racially segregated communities. 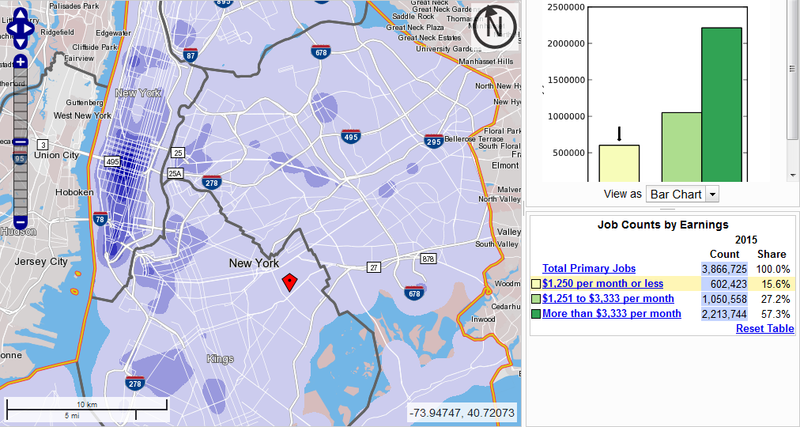 The patterns of white New York employment are similar to those of middle-class New York employment, and those of black, Hispanic, and Asian employment are similar to those of the working class, with small differences (Asians are somewhat more concentrated in Flushing, and blacks in Downtown Brooklyn, reflecting the fact that blacks are overrepresented in public employment in the US and all city workers in Brooklyn are counted at Court Square). This is true provided that opportunities for transportation are available without class segregation. This is not the situation in New York today. Commuter rail actually serves working-class jobs better than middle-class jobs, since Penn Station is closer to the department stores of 34th Street than to the office towers in the 50s. However, it’s priced for the middle class, forcing the working class to take slower buses and subway trains. When I posted the above maps on Twitter, Stephen Smith chimed in saying that, look, the poor are less likely to work in the CBD than the middle class, so everywhere-to-everywhere public transportation is especially useful for them. While Stephen’s conclusion is correct, it is not supported by this specific data. In the $40,000 and up category, 57% of city jobs are in Manhattan south of 60th Street, compared with 37% in the $15,000-40,000 and under-$15,000 categories. It’s a noticeable difference, but not an enormous one. The reason Stephen is correct about how rides crosstown transit is different: people who can afford cars are very likely to drive if the transit option is not good (which it isn’t today), whereas people who can’t are stuck riding slow crosstown buses; in contrast, for CBD-bound commutes, the subway and commuter rail work reasonably well (especially at rush hour) and driving is awful. Instead of trying to look specifically at low-income and middle- and high-income job centers, it’s better to just plan transit based on general commute patterns, and let anyone take any train or bus. This doesn’t mean business as usual, since it requires transitioning to full fare integration. Nor does this mean ignoring residential segregation by income, which in some cases can lead to transit segregation even in the face of fare integration (for example, the crosstown buses between the Upper East Side and Upper West Side have mostly white, mostly middle-class riders). Finally, this doesn’t mean relying on middle-class transit use patterns as a universal use case, since the middle class drives in the off-hours or to off-CBD locations; it means that relying on middle-class transportation needs could be reasonable. It just means that the rich and poor have substantially the same destinations. An even bigger implication relates to questions of redevelopment. There have been periodic complaints from the left about gentrification of jobs, in which working-class job sites are turned over to high-end office and retail complexes. For example, Canary Wharf used to be the West India Docks. In New York, Jane Jacobs’ last piece of writing before she died was a criticism of Greenpoint rezoning, in which she specifically talked up the importance of keeping industrial jobs for the working class. But since the big deindustrialization wave, developments brought about by urban renewal, gentrification, and industrial redevelopment have not had any bias against providing employment for the poor. It’s not the factory jobs that the unionized working class still culturally defines itself by, but it’s industries that are hungry for low-skill work, and in many cases are serious target of unionization drives (such as universities). The Regional Plan Association has a detailed regional rail proposal out. It’s the same one from the Fourth Plan that I’ve criticized here, on Streetsblog, and on Curbed, but with more explanation for how the service should run, with stopping patterns and frequency. There are some good aspects there, like a section about the importance of electrification and multiple-units, though it stops short of calling for full electrification and replacement of locomotives with EMUs; the focus on off-peak frequency is also welcome. There are also bad ones, like the claim on p. 32 that it’s difficult to impossible to provide through-running using the existing Penn Station tracks used by New Jersey Transit. Foster Nichols told me that there are some difficulties with grades but they should be doable if NJT commits to an all-EMU fleet, and reminded me that the ARC studies judged through-running using these station tracks and new tunnels feasible. What he expressed to me as a difficulty turned into a near-impossibility in the report, in order to justify the $7 billion Penn Station South project. But I want to focus on one particularly bad aspect of the proposal: the stopping patterns. The RPA is proposing three distinct stopping patterns on pp. 32-45, with three separate brands: Metro, in the city and some inner suburbs; Regional Express (RX), in the suburbs; and Trans-Regional Limited (TRL), providing intercity service to New Haven, Ronkonkoma, Philadelphia, and other major stations outside the built-up area. Even as the plan talks about the importance of making sure suburban trains serve urban stations in order to give them frequent service through overlay, the stopping patterns suggest the opposite. The proposal involves trains from the suburbs expressing through most city stations (including the infill) even on two-track lines, like the Port Washington Branch. Metro trains would make all current stops plus additional infill to Bayside, and RX trains would only serve Willets Point, Flushing, and Bayside, and then run from Bayside to Port Washington. A similar pattern happens from Jamaica to Valley Stream, resulting in the Babylon, Long Beach, and Far Rockaway Branches all having to share a track pair. Moreover, the RX trains may themselves be divided into local and express trains, for example on the New Haven Line. This is bad practice. On a two-track line, there’s no real reason to skip a handful of inner stations just to guarantee the outer ones express service. If anything, the need to schedule trains on the same tracks would lead to more fragile timetables, requiring more schedule padding. My analysis from 2.5 years ago found that the LIRR Main Line is padded 32% and the Babylon Branch is padded 19%: that is, the scheduled travel time on the Main Line (up to Ronkonkoma) is 32% more than the travel time imputed from line speed limits and current fleet acceleration performance. Patrick O’Hara, who the RPA study even quotes as a source elsewhere, investigated this issue separately, looking at best-case timetables, and found that some runs are padded 40-50%. In Switzerland, trains are padded 7%, and I’m told that in Japan, after the Amagasaki accident showcased the safety problems of overly precise schedules, pads are about 5%. Express trains and locals mixed on the same line make it harder to maintain tight enough reliability for low schedule padding; this way, on an all-local line, trip times may match those of express trains on mixed lines, as they do in my analysis above. The best analogy is the RER B going to the north: the express trains are 4 minutes faster than the local trains, skipping 9 stops. The stop penalty on the RER B is higher, closer to 7 minutes over 9 stops, but the shared tracks with local trains (and with the RER D between Gare du Nord and Chatelet-Les Halles) means that there’s a fudge factor in the schedule, so it’s not possible to reliably do better than 4 minutes, and the trains end up visibly crawling on the mainline. The reader familiar with technical transit advocacy in the Bay Area may interject, what about Caltrain? Clem Tillier has no trouble proposing timetables mixing local trains, express trains, and high-speed rail on the same track pair with timed overtakes, and a 7% pad. So why am I down on this concept in New York? The answer is line complexity. Caltrain is a simple two-track back-and-forth, and HSR is generally more punctual than legacy trains because it runs for long stretches on high-quality dedicated tracks, so it’s unlikely to introduce new variability to the line. In contrast, the RPA plan for regional rail in New York involves extensive branching, so that train schedules depend on trains elsewhere on the line. In this case, introducing more complexity through local/express sharing is likely to require more schedule padding, erasing the speed advantage. How long is the line, measured in the number of stations? More stations encourage more express trains, because more stations can be skipped. In higher speed zones, stop penalties are higher, but at equal line length measured in km, higher speeds and fewer local stations reduce the benefit of express trains. How frequent are trains? At low frequency, local stations need more frequency, so express runs are less useful. At very high frequency, there may not be capacity for different stopping patterns unless the line has four tracks. On a two-track line, the optimum frequency for a local/express alternation is about 6-12 trains per hour, 3-6 local and 3-6 express, with a single mid-line overtake. Multiple overtakes on a single line are possible, but more fragile, so they are a bad idea except in special circumstances. What is the demand for travel? Express trains work best if there are a few distinguished stations at regular intervals, or else if the line is long and there is strong demand at the far end; if the inner stations are very strong then it’s more important to give them higher local frequency. When performing this analysis, it’s important to make sure station ridership levels reflect genuine demand rather than service. For example, Caltrain express stops have high ridership in large part because of their better service, not nearby density, as shown in Clem Tillier’s analysis. The LIRR Main Line has far more ridership at Mineola and Hicksville than the other stations on the trunk and also far more service, but Patrick explains that this is due to better highway access, so it’s genuine demand and not just a reflection of better service. Caltrain needs express service because it has about 20 stations between San Francisco and San Jose, depending on the amount of infill and anti-infill desired; a target frequency of 8-10 peak trains per hour; and strong demand on the outer stations, especially for reverse-peak trips. In New York, none of the two-track lines meets the same standard. Some are too short, such as the Port Washington Branch. Others are too busy, such as the Harlem Line, Babylon Branch, and LIRR Main Line. Yet others have too much demand clustering in the inner stations, such as the Erie lines and the North Jersey Coast Line. On four-track lines, it’s always easier to run express service. This doesn’t mean it should always be run: the upper New Haven Line is a strong candidate for relegating all commuter trains to the local tracks, making all stops, giving the express tracks to intercity trains. The Northeast Corridor Line in New Jersey is a dicey example: past Rahway there are four tracks, but intercity trains could run at very high speeds, making track sharing on the express tracks difficult. My service pattern map has express trains skipping Edison and Metuchen, but it’s just two stations, making it better to just run local beyond Rahway to clear the express tracks for high-speed rail. It’s tempting to draw proposals involving intense metro-style regional rail service only serving the urban and inner-suburban stations; I’ve had to argue against such plans on some MBTA lines. The problem is that trains from the outer suburbs are still necessary and still going to pass through the inner suburbs, and in most cases they might as well stop at those stations, which need the frequency more than the outer suburbs need the few minutes of speedup. Thanks to the invitation of Adina Levin’s Friends of Caltrain, I came to the Bay Area for a few days, giving two talks about regional rail best industry practices in front of Friends of Caltrain, Seamless Bay Area, and SF Transit Riders. My schedule was packed, including a meeting with a world-leading expert in transportation systems in which I learned about the Barcelona bus service changes; a Q&A about both general and Bay Area-specific issues for Bay City Beacon subscribers; and several other meetings. My two talks were in Mountain View and San Francisco, and used the same slides, with minor corrections. Here are the slides I used in San Francisco; I consolidated the pauses so that each page is a slide rather than a line in a slide. This was also covered in Streetsblog, which gives more background and gives some quotes from what I said during the presentation, not printed in the slides. 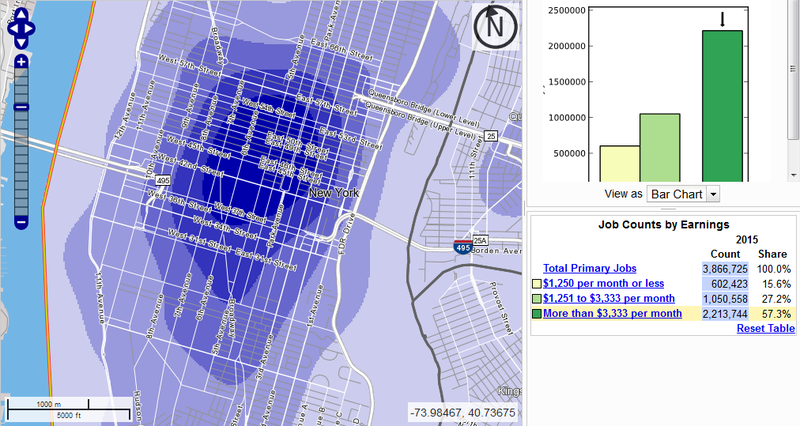 Unlike in my NYU presentation last year, I did not include a proposed map of service improvements. The reason is that in the Bay Area, there are more questions than answers about which service should use which piece of infrastructure. This makes fantasy maps dangerous, as they tend to fix people onto one particular service pattern, which may prove suboptimal based on decisions made elsewhere in the system. This is not a huge problem in New York or Boston, where the alignments naturally follow where the stub-end commuter lines are, with only a few questions; but in the Bay Area, the situation is more delicate, because big questions like “can/should Caltrain get a trans-Bay connection from San Francisco to Oakland and the East Bay?” can go either way. The role of redevelopment in the area is especially important. Unlike New York, Paris, or other big transit cities, San Francisco does not have much density outside the city proper, Oakland, or Berkeley. Moreover, there is extensive job sprawl in Silicon Valley, which contributes to a last-mile problem for public transit; usually first-mile access is a bigger problem and high-end jobs tend to cluster near train stations. But conversely, the high incomes in the Bay Area and the growth of the tech industry mean that everywhere TOD is permitted in the core and the suburbs, it will be built. This impacts decisions about the total size of transit investment. At present-day development patterns, San Francisco proper really doesn’t need more rail construction except Geary and the Downtown Extension, depending on construction costs. But general upzoning makes Geary worth it even at $1 billion per km and opens up the possibilities of four-tracking Caltrain within the city (which means expanding some tunnels), giving the N-Judah dedicated tracks and a dedicated tunnel under Mission, and extending the Central Subway to the north and northwest. The land use in the Richmond and Sunset Districts today supports a fair amount of transit, but not new subways if there’s no cost control. Governors Andrew Cuomo (D-NY) and Phil Murphy (D-NJ) announced that they would cooperate to form a Lower Hudson Transportation Association, or LHTA, to supersede what they described as antiquated 20th-century thinking and bring the region’s transportation into the 21st century. LHTA would absorb the transportation functions of Port Authority, which senior New York state officials speaking on condition of anonymity called “irredeemably corrupt,” and coordinate planning across the region. Negotiations with the state of Connecticut are ongoing; according to planners in New Jersey, the timing for the announcement was intended to reassure people that despite the lack of federal funding for Gateway, a lower-cost modified version of the project would go forward. But the first order of business for LHTA is not Gateway. The governors’ announcement mentioned that LHTA would begin by integrating the schedules and fares throughout the region. By 2019, passengers will be able to transfer between the New York City Subway and PATH for free, and connect from the subway to the AirTrain JFK paying only incremental fare. Engineering studies for removing the false walls between PATH and F and M subway platforms are about to begin. Commuter rail fare integration is also on the table. Currently, the fare on the subway is a flat $2.75. On commuter rail, it is higher even within New York City: a trip between Jamaica Station and New York Penn Station, both served by the E line of the subway, is $10.25 peak or $7.50 off-peak on the Long Island Railroad (LIRR). The governors announced that they would follow the lead of European transportation associations, such as Ile-de-France Mobilités in Paris, and eliminate this discrepancy under LHTA governance, which also includes revenue sharing across agencies. Detailed studies are ongoing, but in 2019, LHTA will cut commuter rail fares within New York City and several inner cities within New Jersey, including Newark, to be the same as the subway fare, with free transfers. Simultaneously, LHTA will develop a plan for schedule integration, coordinating New Jersey Transit, the LIRR, Metro-North, and suburban bus agencies. In order to make it easier for suburban passengers to reach commuter rail stations, the suburban buses will be timed to just meet the commuter trains, with a single ticket valid for the entire journey. Today most passengers in the suburbs drive to the commuter rail stations, but the most desirable park-and-rides are full. Moreover, the states would like to redevelop some of the park-and-rides as transit-oriented development, building dense housing and retail right next to the stations in order to encourage more ridership. Moreover, the LIRR and New Jersey Transit’s commuter trains currently stub-end at Penn Station in opposite directions. LHTA is studying French and German models for through-running, in which trains from one suburb run through to the other instead of terminating at city center. Planners within several agencies explain that the systems on the Long Island and New Jersey side are currently incompatible – for example, LIRR trains are electrified with a third rail whereas New Jersey Transit trains are electrified with high-voltage catenary – but reorganizing these systems for compatibility can be done in a few years, well before the Gateway project opens. In response to a question about the cost of this reorganization, one of the planners cited the Swiss slogan, “electronics before concrete.” Per the planner, electronics include systems, electrification, and software, all of which are quite cheap to install, whereas pouring concrete on new tunnels and viaducts is costly. The planner gave the example of resignaling on the subway: the New York Times pegged the cost of modernizing subway signals at $20 billion, and this could increase capacity on most lines by 25 to 50 percent. But the cost of building the entire subway from scratch at today’s costs in New York is likely to run up to $200 billion. But while the immediate priorities involve fare and schedule integration, LHTA’s main focus is the Gateway project. There are only two commuter rail tracks between New Jersey and Penn Station, and they are full, running a train every 2.5 minutes at rush hour. The Gateway project would add two more tracks, doubling capacity. The currently projected cost for the tunnel is $13 billion, but sources within New York said that this number can be brought down significantly through better coordination between the agencies involved. This way, it could be funded entirely out of local and state contributions, which add up to $5.5 billion. When pressed on this matter, officials and planners refused to say outright whether they expect $5.5 billion to be enough to cover the tunnel, but some made remarks suggesting it would be plausible. Moreover, some planners suggested reactivating plans to connect Penn Station and Grand Central as part of Gateway. They refused to name a cost estimate, but suggested that at the low end it could be funded out of already-committed state money. Under this plan, there would be through-running between not just New Jersey Transit and the LIRR but also Metro-North, serving the northern suburbs of New York and Connecticut. Sources at the Connecticut Department of Transportation said they are studying the plan and have reservations but are overall positive about it, matching the reports of sources within New York, who believe that Connecticut DOT will join LHTA within six months. Officials are optimistic about the effects of LHTA on the region both privately and publicly. The joint press release referred to the metro area as “a single region, in which decisions made in far apart areas of New York nonetheless affect people in New Jersey and vice versa.” Planners in both states cited examples of friends and family in the other state who they would visit more often if transportation options were better. With better regional rail integration, they said, people would take more trips, improving regional connectivity, and take fewer trips by car, reducing traffic congestion and pollution. Amtrak’s Gateway project, spending $30 billion on new tunnels from New Jersey to Penn Station, just got its federal funding yanked. Previously the agreement was to split funding as 25% New York, 25% New Jersey, 50% federal; the states had committed to $5.5 billion, which with a federal match would build the bare tunnels but not some of the ancillary infrastructure (some useful, some not). When Chris Christie canceled ARC in 2010, then estimated at $10-13 billion, I cheered. I linked to a YouTube video of the song Celebration in Aaron Renn‘s comments. ARC was a bad project, and at the beginning Gateway seemed better, in the sense that it connected the new tunnels to the existing station tracks and not to a deep cavern. But some elements (namely, Penn Station South) were questionable from the start, and the cost estimate was even then higher than that of ARC, which I attributed to both Amtrak’s incompetence and likely cost overruns on ARC independent of who managed it. But I’m of two minds about to what extent good transit advocates should cheer Gateway’s impending demise. The argument for cheering is a straightforward cost-benefit calculation. The extra ridership coming from Gateway absent regional rail modernization is probably around 170,000 per weekday, a first-order estimate based on doubling current New Jersey Transit ridership into Penn Station. At $40,000 per weekday rider, this justifies $7 billion in construction costs, maybe a little more if Gateway makes it cheaper to do maintenance on the old tunnels. Gateway is $30 billion, so the cost is too high and the tunnel should not be built. Moreover, it’s difficult to raise the benefits of Gateway using regional rail modernization. On the New Jersey side, population density thins fast, so the benefits of regional rail that do not rely on through-running (high frequency, fare integration, etc.) are limited. The main benefits require through-running, to improve access on Newark-Queens and other through-Manhattan origin-destination pairs. Gateway doesn’t include provisions for through-running – Penn Station South involves demolishing a Manhattan block to add terminal tracks. Even within the existing Penn Station footprint, constructing a new tunnel eastward to allow through-running becomes much harder if the New Jersey Transit tracks have heavy terminating traffic, which means Gateway would make future through-running tunnels more expensive. But on the other hand, the bare tunnels are not a bad project in the sense of building along the wrong alignment or using the wrong techniques. They’re just extremely expensive: counting minor shoring up on the old tunnels, they cost $13 billion for 5 km of tunnel. Moreover, sequencing Gateway to start with the tunnels alone allows dropping Penn South, and might make it possible to add a new tunnel for through-running mid-project. So it’s really a question of how to reduce costs. The underground tunneling portion of Second Avenue Subway is $150 million per km, and that of East Side Access is $200 million (link, PDF-p. 7). Both figures exclude systems, which add $110 million per km on Second Avenue Subway, and overheads, which add 37%. These are all high figures – in Paris tunneling is $90 million per km, systems $35 million, and overhead a premium of 18% – but added up they remain affordable. A station-free tunnel should cost $350 million per km, which has implications to the cost of connecting Penn Station with Grand Central. Gateway is instead around $2 billion per km. Is Gateway expensive because it’s underwater? The answer is probably negative. Gateway is only one third underwater. If its underwater character alone justifies a factor of six cost premium over Second Avenue Subway, then other underwater tunnels should also exhibit very high costs by local standards. There aren’t a lot of examples of urban rail tunnels going under a body of water as wide as the Hudson, but there are enough to know that there is not such a large cost premium. In the 1960s, one source, giving construction costs per track-foot, finds that the Transbay Tube cost 40% more than the bored segments of BART; including systems and overheads, which the source excludes, BART’s history gives a cost of $180 million, equivalent to $1.38 billion today, or $230 million per km. The Transbay Tube is an immersed tube and not a bored tunnel, and immersed tubes are overall cheaper, but a report by Transport Scotland says on p. 12 that immersed tubes actually cost more per linear meter and are only overall cheaper because they require shorter approaches, which suggests their overall cost advantage is small. Today, Stockholm is extending the T-bana outward in three direction. A cost breakdown per line extension is available: excluding the depot and rolling stock, the suburban tunnel to Barkarby is $100 million per km, the outer-urban tunnel to Arenastaden in Solna is $138 million per km, and the part-inner urban, part-suburban tunnel to Nacka is $150 million per km. The tunnel to Nacka is a total of 11.5 km, of which about 1 is underwater, broken down into chunks using Skeppsholmen, with the longest continuous underwater segment about 650 meters long. A 9% underwater line with 9% cost premium over an underground line is not by itself proof of much, but it does indicate that the underwater premium is most likely low. Based on the suggestive evidence of BART and the T-bana, proposing that bare Hudson tunnels should cost about $2-2.5 billion is not preposterous. With an onward connection to Grand Central, the total cost should be $2.5-3 billion. Note that this cost figure does not assume that New York can build anything as cheaply as Stockholm, only that it can build Gateway for the same unit cost as Second Avenue Subway. The project management does not have to be good – it merely has to be as bad as that of Second Avenue Subway, rather than far worse, most likely due to the influence of Amtrak. The best scenario coming out of canceling Gateway is to attempt a third tunnel project, this time under a government agency that is not poisoned by the existing problems of either Amtrak or Port Authority. The MTA could potentially do it; among the agencies building things in the New York area it seems by far the least incompetent. If Gateway stays as is, just without federal funding, then the solution is for Amtrak to invest in its own project management capacity. The cost of the Green Line Extension in Boston was reduced from $3 billion to $2.3 billion, of which only $1.1 billion is actual construction and the rest is a combination of equipment and sunk cost on the botched start of the project; MBTA insiders attribute this to the hiring of a new, more experienced project manager. If Gateway can be built for even the same unit cost as Second Avenue Subway, then the existing state commitments are enough to build it to Grand Central and still have about half the budget left for additional tunnels.